Somewhere along the way, Pappy Van Winkle whiskeys became known as the best whiskeys money can buy. There are even some exaggerated tall tales where money can’t even buy it, and millionaires have just as much of a hard time obtaining it as you and I. Of course Pappy isn’t impossible to obtain, as about 84,000bottles are released each fall, yet its legendary status and demand for it never seem to waver. With anything that gathers this much attention you always have to ask yourself, is it reallythat good? 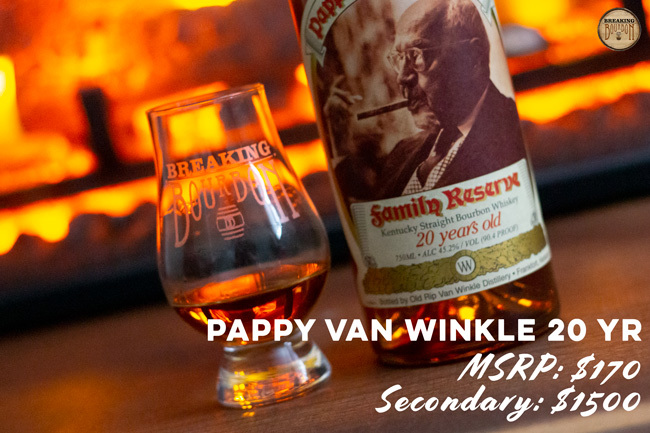 I decided it was a good time to taste each Pappy Van Winkle whiskey and see if the whiskey can stand up to the hype that people bestow on it. ...Of course the problem is it’s Pappy Van Winkle and really hard to get one bottle, let alone all six whiskeys together in one place (and yes I’m considering all six Van Winkle whiskeys more or less “Pappy” as they are released as a group and equally hyped). 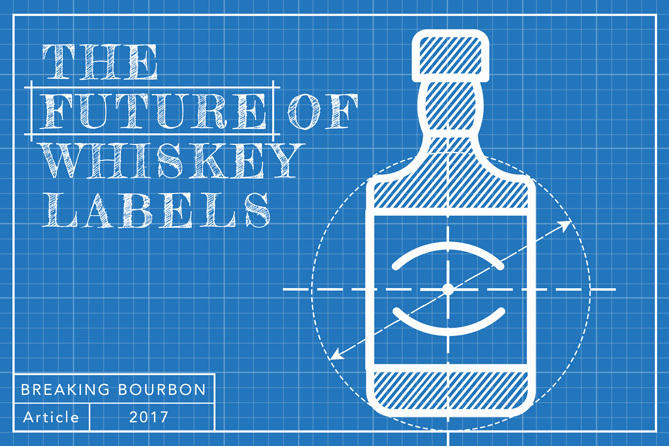 You may think being the most popular bourbon website in the world we have bunkers filled with an endless supply of it, but that is simply not the case. 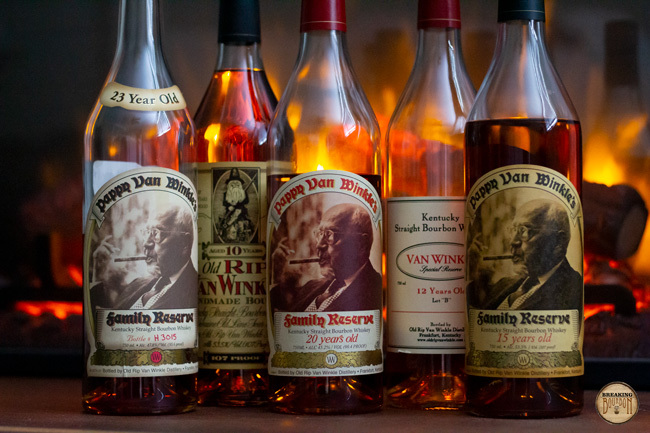 Finding a bar with all five was one option, but a Pappy flight will run hundreds of dollars. I went with a alternative option and asked everyone I knew if they would let me “borrow” their Pappy for “research purposes” in combination with a few bottles I had to round out the group. After a few raised eyebrows and blank stares, I was actually able to pull it off. Of course going this route meant I couldn’t be picky. The set I pulled together are from different years. Some have been opened for some time and one is being opened for the first time. Yes this will skew the “results,” but this isn’t a full on review, nor is it a scientific study. I’m simply trying to examine if Pappy Van Winkle whiskeys are as good as their legend and hype have claimed them to be. 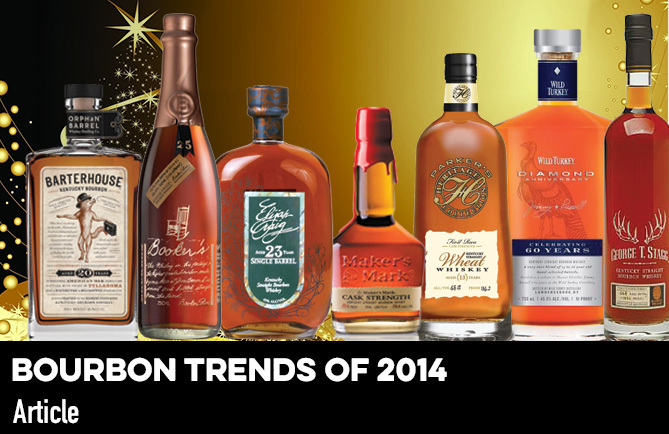 And as Pappy MSRP (and secondary) prices have risen, are they still worth the money? There’s only one way to find out. I’ll take one for the team and start my deliberations. ‍Nose: Butterscotch, gingerbread, caramel. Understated and not overly unique. ‍Palate: Spice, nutmeg, tobacco, burnt caramel. A notch above average. ‍Finish: Dry, heavy oak, hot, and simple. ‍Overall Thoughts: I feel Old Rip sees the largest swings in flavor and overall quality each year. 2012 was the last of the squat bottle and I remember it being very spicy and truthfully not all that great. When the bottle design switched to the tall skinny version, it saw a few great years of satisfying releases that starkly contrast this year’s release. 2018’s Old Rip unfortunately doesn’t impress me at all. It has a nice mouthfeel and overall consistency, but it lacks a depth of flavor and is dominated by spice, oak, and a very dry finish. It's far from a bad bourbon, but not what anyone would expect from a bottle with the Van Winkle name on it. ‍Nose: Apple, apricot, cherry, vanilla, mild oak. Quite expressive with an overall aroma that has some weight to it. ‍Palate: Apricot, cherry, mild oak, touch of peach. Surprisingly sweet. ‍Finish: Cherry, oak, quite palatable. 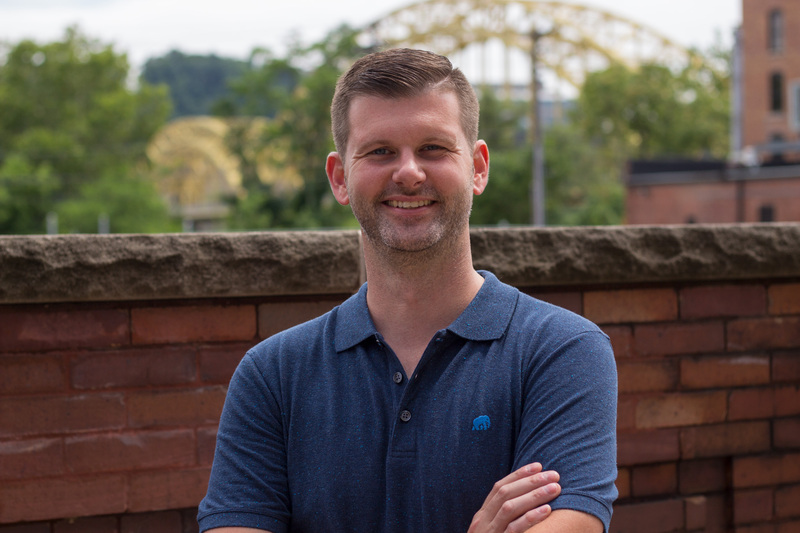 ‍Overall Thoughts: I’ve always been a fan of Lot B. It’s sweet and fruity and easy to enjoy. It was the first Van Winkle bourbon I owned and I gladly shared it with whoever was interested in trying it. Of course I never had anyone refuse it, but more importantly, everyone that tried it, loved it. That’s a good way to sum up Lot B. It’s a crowd pleaser. 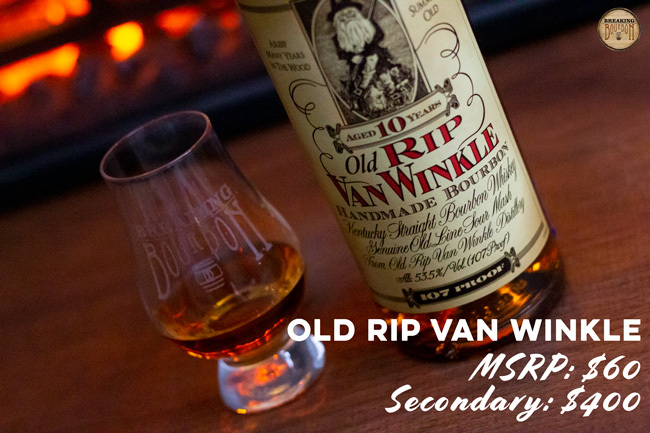 It also has the most in common with Pappy 20 Year with its fruit-forward palate than any of the other Van Winkle bourbons. At the same time, it’s a bit simple and its proof is a bit light for its flavor profile. It’s often the most overlooked in the collection and part of that is probably due to its lackluster labeling. It deserves better. 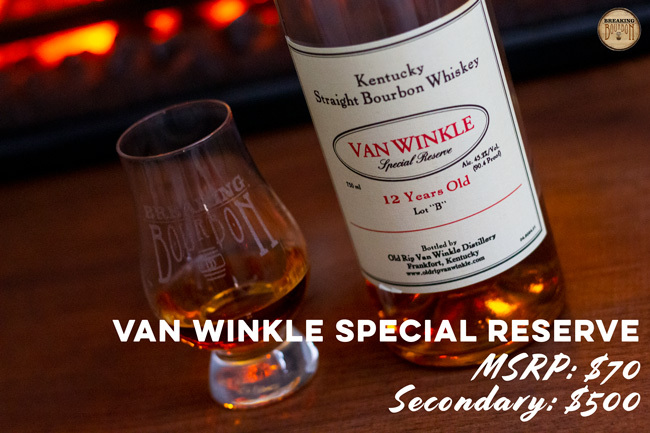 It’s a great bourbon with easy-to-enjoy flavors, but I just don’t know if it has enough of the “Pappy magic” to warrant the kind of price it commands on the secondary. If I’d never had it before, I’d gladly pay up, but after the hype fades, I’d think twice. ‍Palate: Leather, cherry, cinnamon, vanilla. A nice blend of sweet and spice. ‍Finish: Oak, caramel, bit of clove and wheat. The wheat, while not dominant adds a lot to the finish. ‍Overall Thoughts: There are times when I’ve had this and it tasted very matter-of-fact. There are other times where some of its Pappyness pulls through, and I’m reminded exactly what I’m drinking. 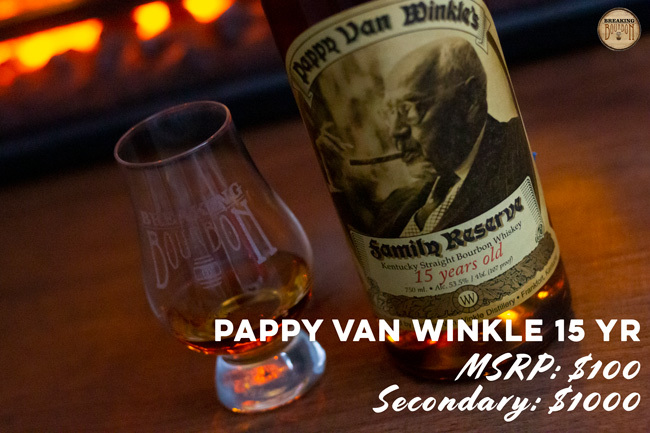 Some of it I’ll attribute to the “Pappy magic,” but probably more of it is due to its mix of sweet fruit, lightness from the wheat, and a balancing of oak that give this bourbon its notoriety. I said the 12 Year has a lot in common with the 20 Year, and I think the 15 Year shares a lot with the 23 Year. It features a nice complexity where it needs to be, and a sweetness that runs through it and makes it all too easy to enjoy. To be honest, I wasn’t blown away by my first sip. It wasn’t until a few more that the bourbon really opened up and revealed a buttery and oily mouthfeel; that when combined with its palate and finish, really hit the spot. I’ve never been very big on the 15 Year, but this latest tasting allowed me to understand it better and appreciate what it brings to the table. ‍Palate: Cherry, fruit punch, cinnamon, buttery mouthfeel. This is where the “Pappy” taste really shines. ‍Finish: Spice, vanilla, oak, some dryness. A satisfying and uneventful finish. ‍Overall Thoughts: This has always been my favorite Van Winkle bourbon and after this recent tasting, it remains that way. It has aspects of all of the other Van Winkle bourbons in a single package. It’s nose is by far the best out of the bunch. It proves how important a bourbon’s nose really is to the entire tasting experience. The palate features the rich fruit flavors of the 12 Year, the cinnamon of the 15 Year, and a touch less oak than the 23 Year. It’s beautifully constructed and remains one of my favorite bourbons ever. ‍Nose: Cherry, almond, caramel, mild oak. Sweet, pleasant and peppy. ‍Palate: Candy corn, vanilla, cherry, oak. Better than I expected it to be. ‍Finish: Oak, walnut, dark raspberry, mild dryness. A good balance overall. ‍Overall Thoughts: It starts right out of the gate with an impressive nose that's distinctly Pappy. It’s rich, sweet, and flavorful aromas are beautifully balanced and hard to imitate. The palate brings a lot of pleasing flavors together on a strong oak backbone that’s hard to ignore, yet hard to call overbearing. It takes a lot of what makes Pappy 20 Year great and complements it with additional layers of oak. This is far from being “over-oaked” and a prime example of a high-aged bourbon that’s aged perfectly. It’s worth pointing out that the 23 Year eschews deep complexity for more crowd pleasing flavors and makes you think hard about what you want out of a $270+ bourbon. And that’s the thing, sure it’s Pappy and hard to pass up a chance to own it given the chance, but it’s also nearly $300. There are few bourbons I personally feel are worth that much money, but this would be one of them. The 23 Year is a great bourbon and probably worth the dough, but I have a hard time spending that on any bourbon, regardless of whether it features an old man smoking a cigar on it. ‍Palate: Spice, cinnamon, vanilla, caramel, black pepper. Gentle and memorable. ‍Finish: Mild buttery spice, toffee, oak, touch of fruit. ‍Overall Thoughts: Excellent. It has an amazing consistency, pureness of flavor and gracious finish that makes this one of the pinnacles of American whiskey. It does taste more like a bourbon than a rye, but does that matter when something tastes this good? This is one of the closest to perfection whiskeys I’ve ever had, and it’s a shame it so hard to get. Also starting this year, it switched to a new tanked batch so there is no guarantee it will taste the same as the previous batch (look to recent Sazerac 18 Years for a case study). 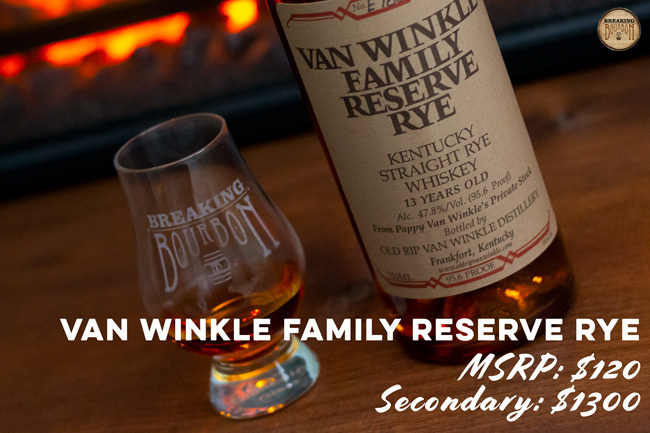 Van Winkle Family Reserve Rye definitely lives up to the hype and worth seeking out if your budget can allow it. There’s no doubt in my mind that Van Winkle whiskeys are great whiskeys. They often receive more hype than they typically deserve, but that doesn’t mean you should ever pass them up. For the most part they are fairly consistent every year, unlike other special releases that can be either hard passes one year or must-haves in another. That’s a good thing for Pappy fans as they don’t have to be choosy if they are looking to obtain one. It’s hard to discuss Van Winkle whiskeys without also talking about price. Of course everyone has the right to spend as much as they feel comfortable spending in order to obtain anything. But with all whiskey, a reality check can sometimes be in order. Personally, I have a hard time paying double MSRP for any of these whiskeys. I totally get paying any amount in order to capture your first Pappy. It’s a pure rush. Looking at secondary prices, especially the 20 and 23 Year, you just have to ask yourself, is any bourbon worth that amount? If it is, go for it, as the higher-aged bourbons and the rye are exceptional and hard to find major faults with. 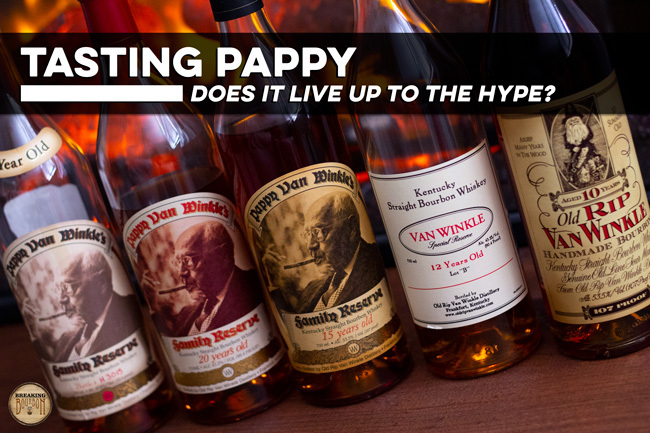 The Pappy hype train has been going for the better part of this decade and doesn’t see any signs of cooling down right now. At the height of any hype it’s hard to see the breaking point, but it’s been proven more times than not, the breaking point eventually comes. If you have patience, and the brand’s quality maintains itself, there is a good chance you’ll be able to buy one at some point in the future with less hassle than today. As with any great whiskey, you’ll get the most enjoyment out of it by sharing it with people you care about. 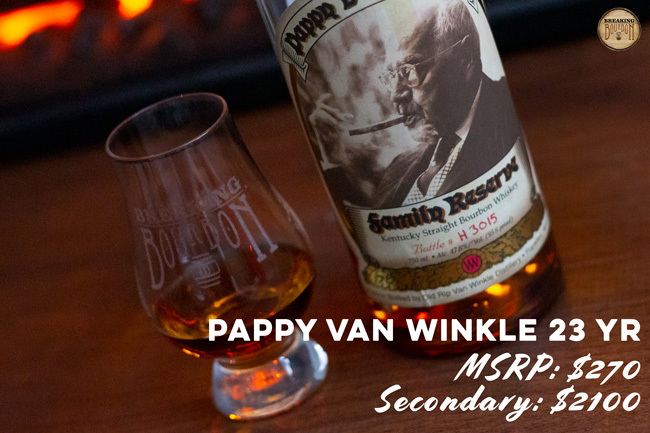 Sure it doesn’t always have to be a Pappy, but Pappy admittedly adds a little more magic to the experience.